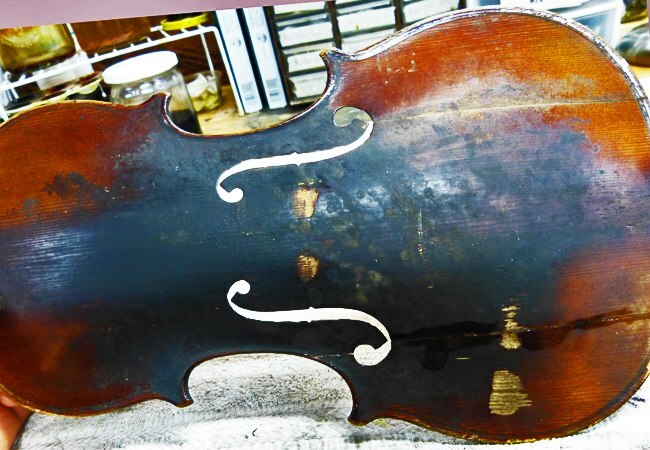 We offer a full range of instrument and bow* repairs from a simple crack or varnish touch up, to complete reconstruction after being run over or sat on; we've seen it all! 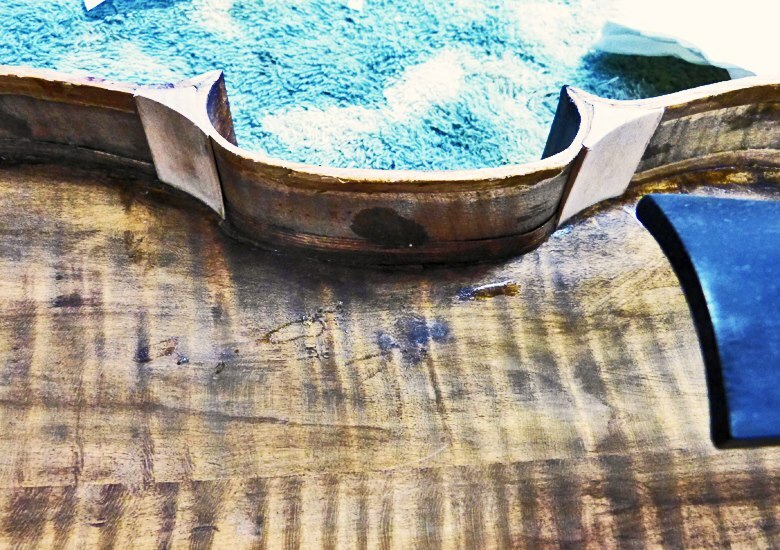 Full estimates are available in the shop. This violin's wing tip broke off, here it is getting a new platform to hold the replacement tip. 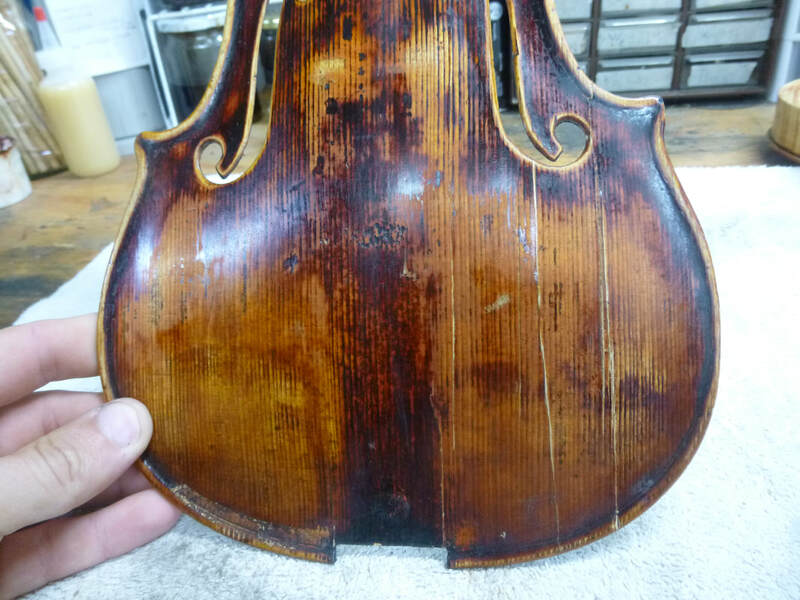 This violin was crushed by a car, seen here the cracks have been put back together but no varnish work has yet been done. 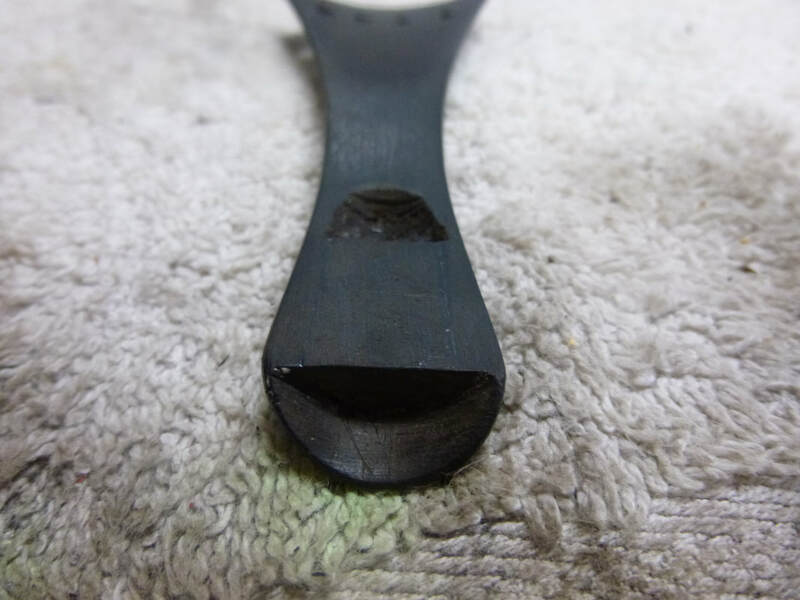 A large crack developed in the scroll and it went through two peg holes, here a new cheek has been grafted on for maximum strength. 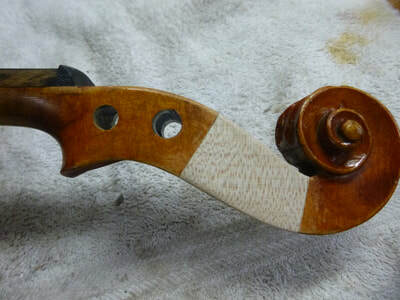 This tailpiece has very unique Mother of Pearl and would be hard to replace, so new ebony was grafted in to allow it to be used again. 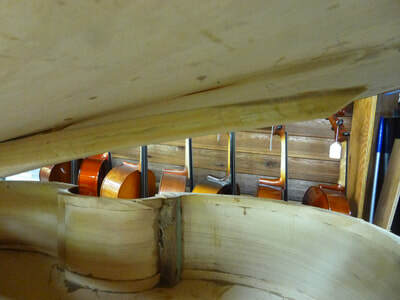 Gluing the top back down on a cello after all internal work has been completed. 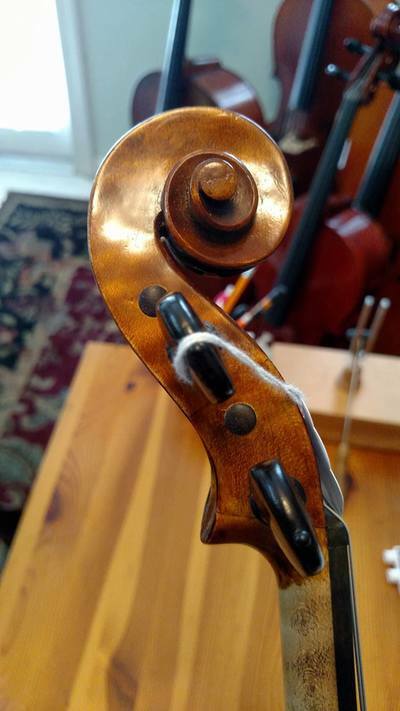 This cello neck came out and broke the button in the process, so a special lamination had to be made to make the neck structurally whole again, while preserving the original button. A very old and dirty violin, before any work has been done. The maker of this violin back in antiquity did not make any cornerblocks, which are vital to the durability of the violin structure, so new ones had to be made. The bassbar came loose from this double bass, but it can be fixed. 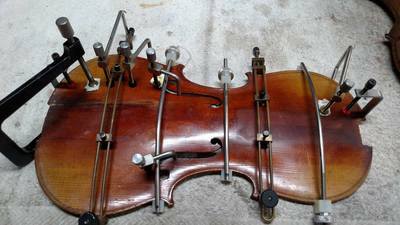 This violin sadly got mechanical pegs installed back in the 40's, so a great deal of damage had to be fixed to allow for standard pegs to be used. 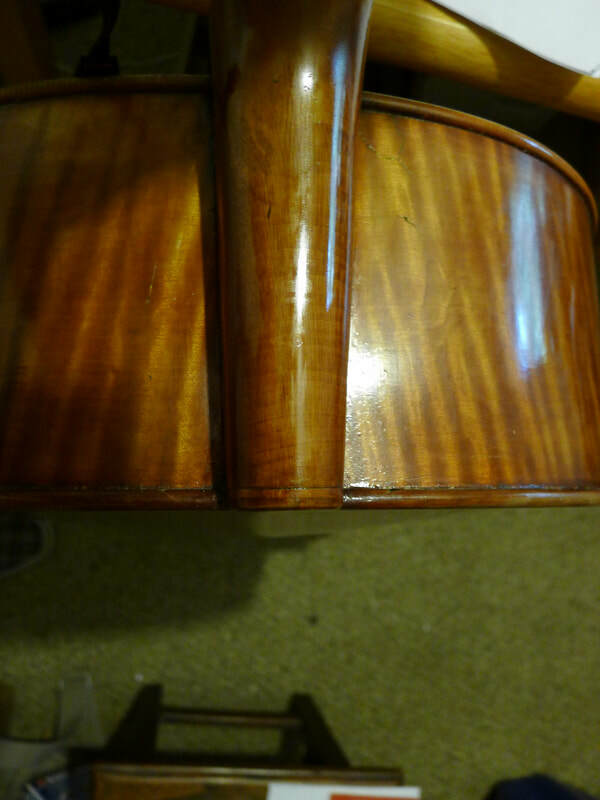 This is an extreme case of heat damage to the varnish. While it can be fixed, it is no simple task. 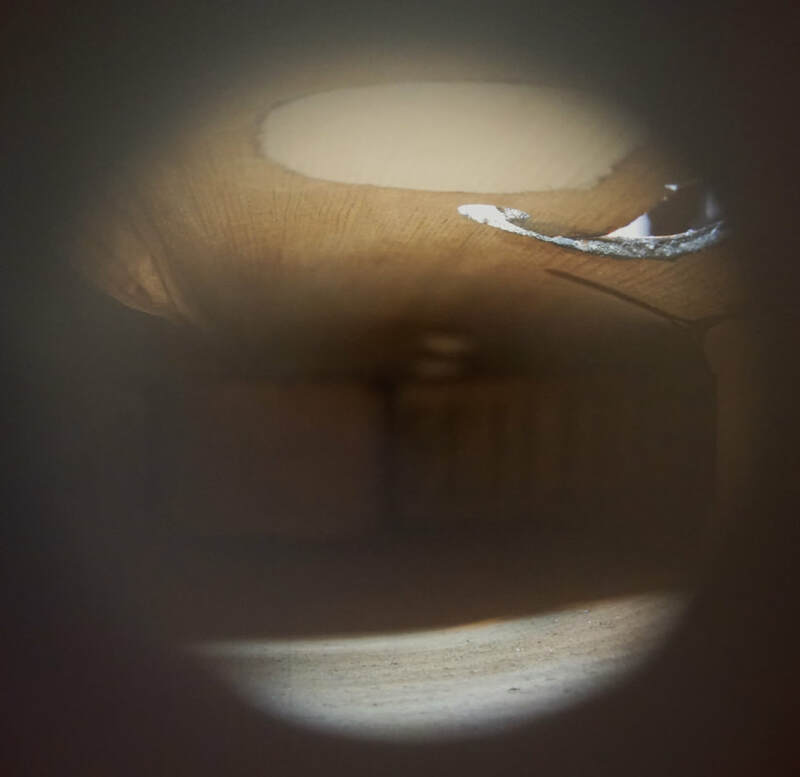 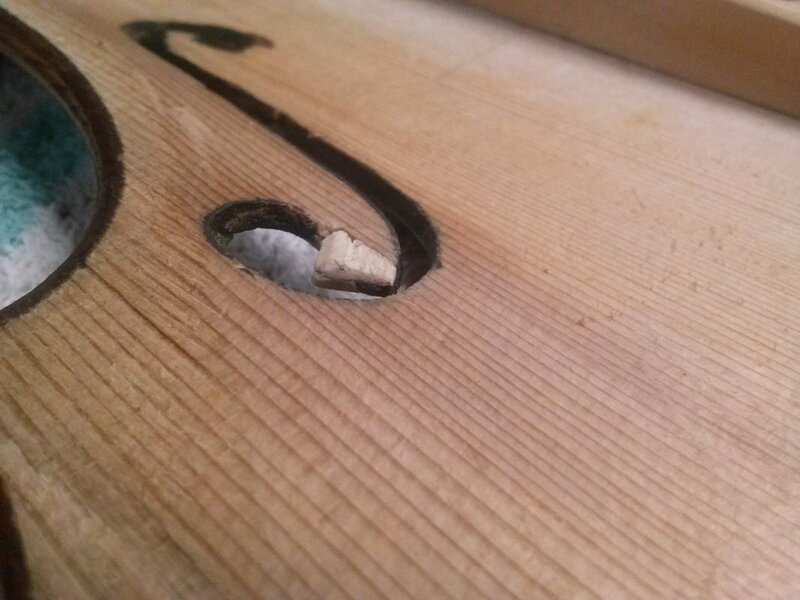 A scroll break like this requires the holes to be filled and new wood laminated onto the sides of the pegbox so that it doesn't break again. 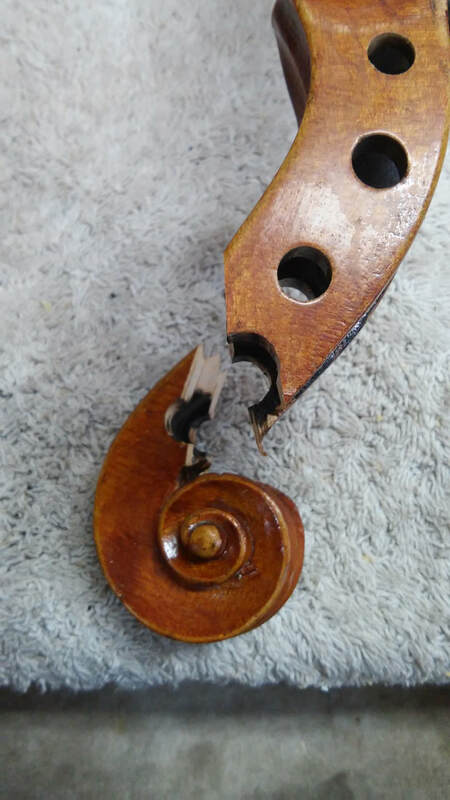 This scroll snapped in two and required cheek grafts to hold it together. Done well, they blend in with the original wood. This violin had fallen at least twice and was riddled with cracks. Seen here are the various clamps I use to bring the wood back together as the glue dries. 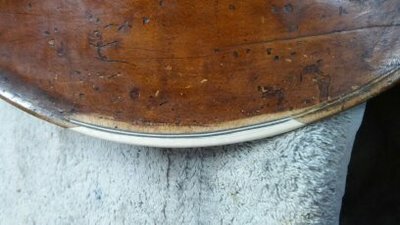 This soundpost patch was put in after a crack was discovered on the top. This is the only area on the instrument where a crack must be fixed in this manner, due to the stress it is under. 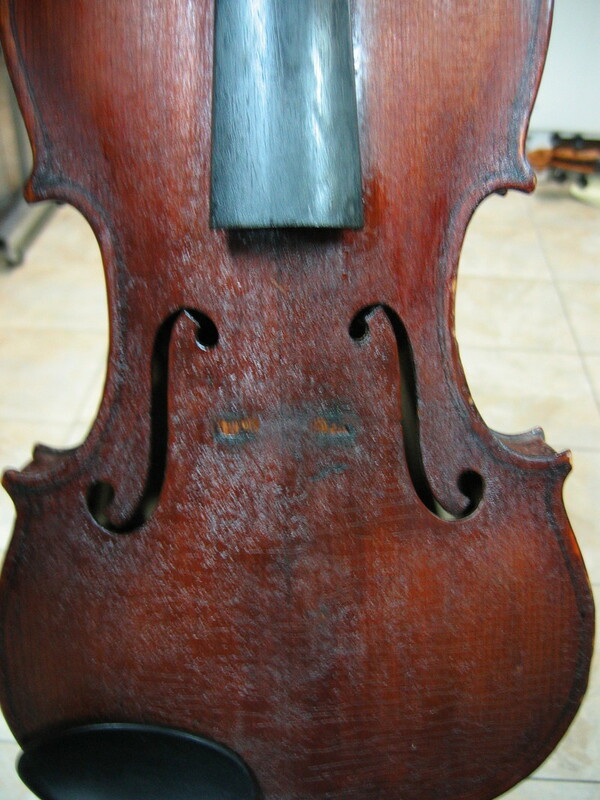 This violin was given a whole new set up, numerous crack repairs, and varnish rejuvenation. 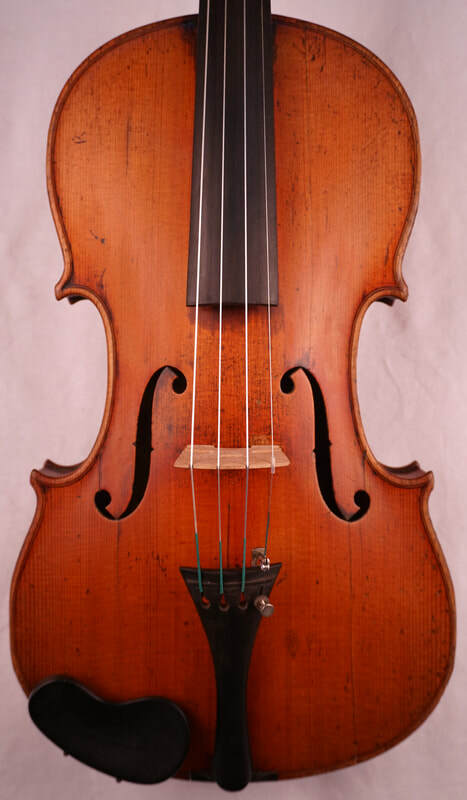 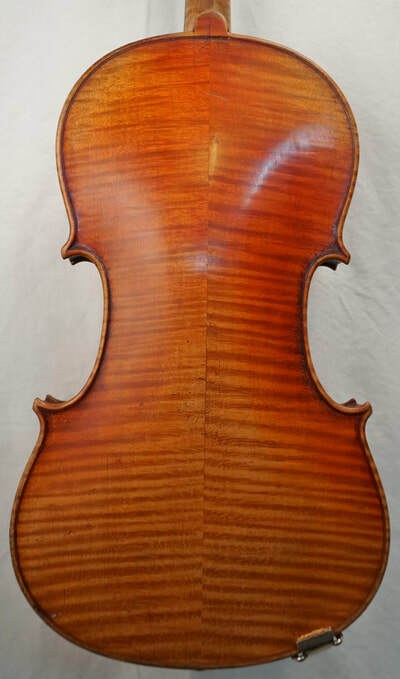 After a violin has been restored, or after it has sat unused for months/years, it's important to get the instrument woken up and settled into its new state, particularly if the top has been removed for internal repairs. 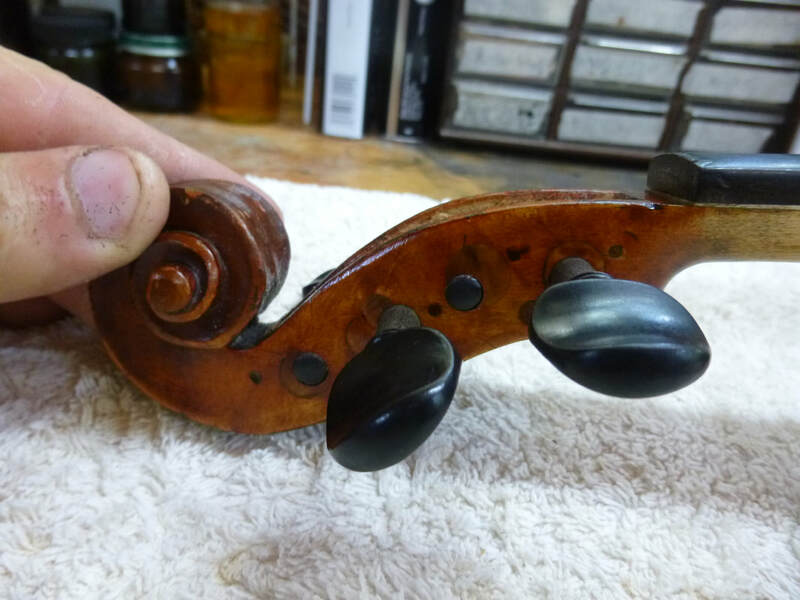 One way to do this is to play the instrument for hours over the span of a few weeks, the other is the Tonerite. 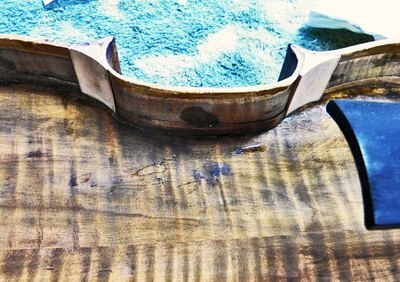 We now offer Tonerite treatments to help facilitate that at a fraction of the cost of buying the Tonerite yourself. Ask about it when you come for a repair! 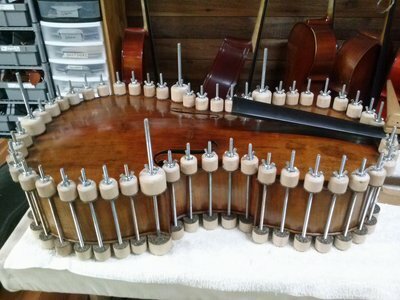 From the Tonerite website : "One of the secrets of great sounding vintage instruments is the fact that they have been played-in for thousands of hours. Subsequent treatments will help maintain your new vintage sound!"